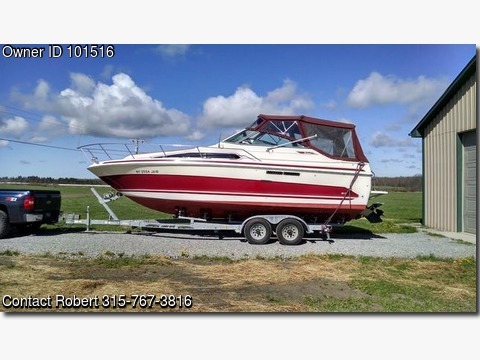 Boat is located in Clayton,NY.. Please contact the owner @ 315-767-3816. One of the best shape older boats you will see in the North Country. 1999 DUAL AXLE LOAD RITE TRAILER INCLUDED Full Canvas good shape New Carpets throughout last year Single 260 HP Mercruiser ...New Bellows, Gimble bearing & seals this year & 12 years of Maint records Pioneer AM/FM/CD/XM radio Standard Horizon Chartplotter/GPS/fisherfinder 7" Screen VHF DCS Radio Hummingbird Fish Finder All approved Coast Guard Equipment and lines, spare prop Inside stored for the past 12 years. Great Starter boat for first time boaters Currently in storage barn. Will send pics to serious inquiries only! Hurry because this will go fast.